Admit it, most of you would fall into somnambulism when going shopping for new curtains, reaching out for the ubiquitous embroidered silks or crushed velvets. If you want to be inspired by luxurious and dramatic curtains, there is another choice. Some people may have encountered laser cut fabrics in recent years, where textiles are perforated with precision cuts, creating intricate patterns. These have now been superseded by 3D designs, the result of a combination of lengthy research, innovation and pure fantasy, where conceptual thinking rubs shoulders with the latest technology. These products capture both the hearts and minds of interior designers. With a myriad of textures available as the focal point, there is no need for novel shades of the latest fashionable colours. Neutral pallets work perfectly, alluring and sympathetic to any interior scheme. Take for example, Myiako design by the German manufacturer Nya Nordiska. It is the highlight of their 2015 collection. On a background made of pure linen, a feather-light organza layer is embroidered in a zigzag, then cut open by laser in between the embroidery. The dissolved organza layer opens up and closes, following the folds in the curtains, creating a three-dimensional look and a delightfully playful appearance. The three dainty colour hues like ivory, soft beige and silver are all you need to show off this energetic design. Another spectacular example of limitless creativity is The Branchiae by French company Series Limitees. This is a curtain entirely handmade from Kvadra Divina fabric (braided cotton ropes) which is produced in numerous colours and bespoke sizes. 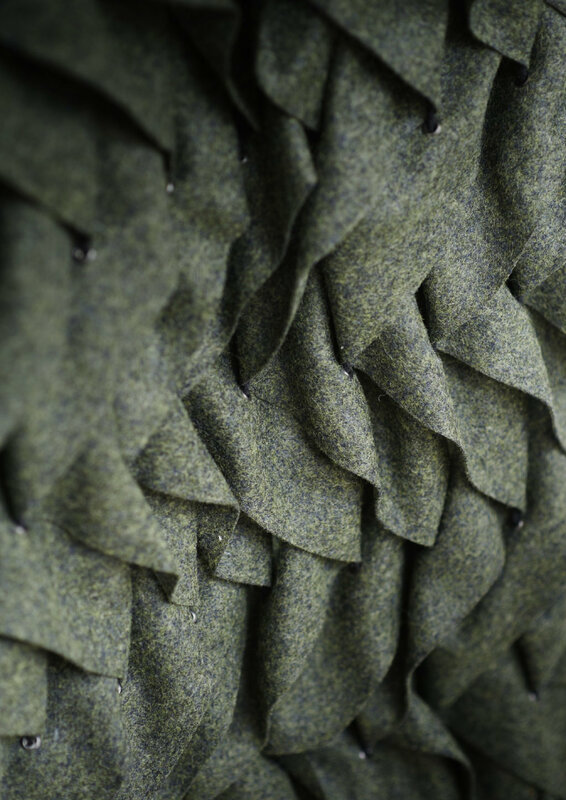 We may already be familiar with 3D textiles created as objet d’art by the likes of artist Jo Hyam, but these curtains are on a par with the art creations snapped up by Galleries and Museums. The voluminous appearance, innate movement and seductive aesthetics are sure to make guests breathless when they walk in to your room. This designs blur the borders between art and functionality. Some manufacturers have taken their inspiration from architectural forms, like the recently launched Axis structural design by Wind in Belgium, which works best on Roman blinds and appeals to both left and right sides of the brain. Others have been inspired by nature. The Rosette design by Indian-based company Kanchi is a multitude of taffeta ribbons folded and stitched on the same background, like petals tightly packed in to neat flowers. I marvel when looking at these visionary, strikingly beautiful and unconventional designs and am enthralled by the prospect of incorporating them into modern interiors. I prophesy, that this is just the beginning and these few innovative designs will become the catalyst for an explosion of creativity amongst textile designers. Rather than sleep-walking, I am dreaming about the emergence of the next generation of textile couturiers who will indulge our perpetual search for individuality and new sentiments of beauty.